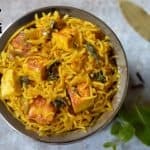 Paneer Biryani recipe is very delicious, flavorful and easy one pot rice recipe. Add mint, coriander leaves, curd, turmeric powder , red chilli powder, biryani masala powder and fried paneer and mix well. Wait for NATURAL PRESSURE RELEASE(NPR) (Wait until silver button on lid drops).BE CAREFUL OF THE HOT STEAM. Paneer Biryani is ready. Squeeze some lime juice ,mix well and Serve with Onion Raita or plain yogurt. Heat a pressure cooker with oil on medium flame, add Bay leaf, cinnamon stick ,cardamom and cloves. Cover the cooker with lid and cook for 1 whistle. 1. For Vegans ,you can skip yogurt and add lime juice or 1 medium tomato. 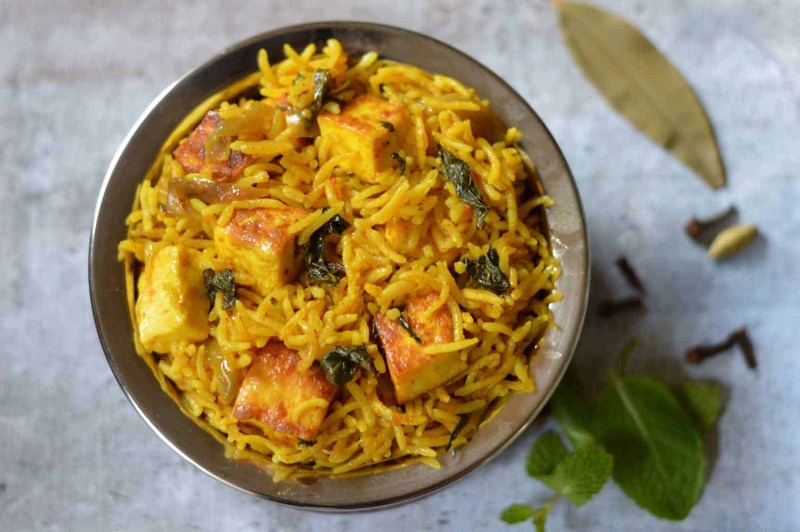 2.I have shallow fried paneer in a pan for biryani,but you can add raw paneer itself. 4.If you dont get biryani powder then replace with same quality of garam masala powder. 5. You can also do a QR Release(QR) if you don’t have time and then open the lid. 6. You can increase or decrease spices accordingly. Beetroot Kurma Instant Pot. Kurma is commonly known by various names such as khorma, korma or qorma and is a popular dish that originated in South or Central Asia. 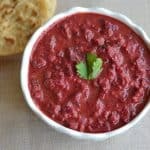 This beetroot kurma is an appetizing, spicy curry that you can use as a side dish for flat breads, pooris, roti, chapati, or plain rice.I have used my mom’s recipe here. Beets are excellent source of folate, manganese, potassium, and copper. They are also a known source of magnesium, phosphorous, vitamin C, iron, vitamin B 6, and dietary fiber. They are low in saturated fat and cholesterol. Also for those of you who do not have an Instant Pot ,check out Indian pressure cooker recipe instructions below. Peel the beetroot and cut it into small cubes. Grind coconut, cashews, cinnamon to a smooth paste. Once POT is hot add onions,ginger-garlic paste and saute until onions turn light brown. Next add chopped tomatoes and cook till they turn soft. Then add in the chopped beetroot, red chilli powder, garam masala powder ,coriander powder , jeera powder , ground coconut-cashew paste , salt and mix well. Then add water and give a stir. Do a NATURAL PRESSURE RELEASE(NPR)(Wait until silver button on lid drops).BE CAREFUL OF THE HOT STEAM. Remove lid away from you, add lime juice and garnish with cilantro.Mix well. 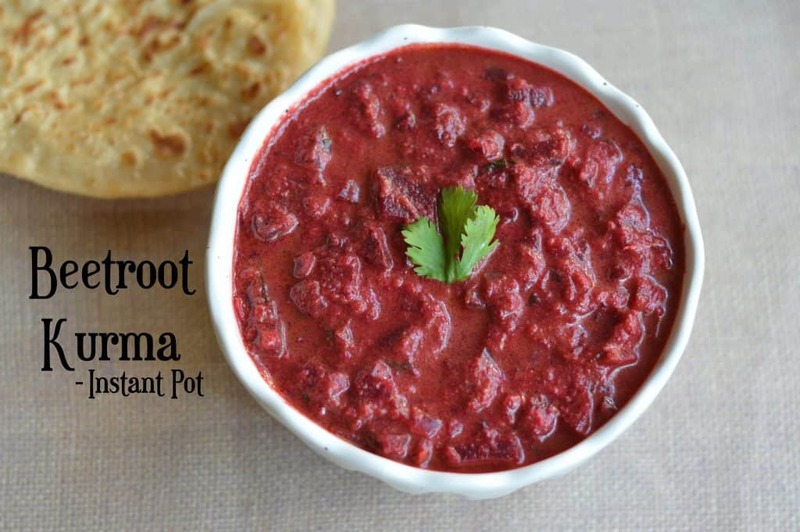 Beetroot Kurma is ready, serve with hot with pooris, chapatis, roti & parathas. Take a kadai/pan. Add oil in to the POT. Once oil is hot add onions, ginger-garlic paste and saute until onions turn light brown. Then add in the chopped beetroot, red chilli powder, garam masala powder ,coriander powder , jeera powder , ground coconut-cashew paste , salt and mix well.cook for 1-2 minutes. Close the lid place a whistle and cook for 2-3 whistles on medium flame. Switch off the flame and let the pressure from the cooker release naturally. Open lid and add lime juice and garnish with cilantro.Mix well. If you are finding difficult to cut beetroot ,just peel and microwave whole beet for 1 minute and cool down.This helps to cut beetroot very easily. You can add Roasted Bengal Gram/fried gram/putani while grinding instead of cashewnuts .It also helps to make gravy thick.But I like adding cashews because it would give nice creamy texture (and increase Calories) and thickness to the Kurma. Adjust the consistency of the Kurma by adding required amount of water. Adjust garam masala powder quantity as per your liking.Traditionally they use home made sambar powder instead of garam masala powder. Additionally poppy seeds can be added while grinding with coconut. If you do not have grated coconut.You can use 1/2 cup of full fat thick coconut milk. You can also add 1/2 cup of fresh or frozen peas.it makes kurma more tasty and healthy. Adjust cooking time as per the setting of your pressure cooker and stove. You can replace Beetroot with the vegetable of your choice and make Vegetable Kurma using the same method. 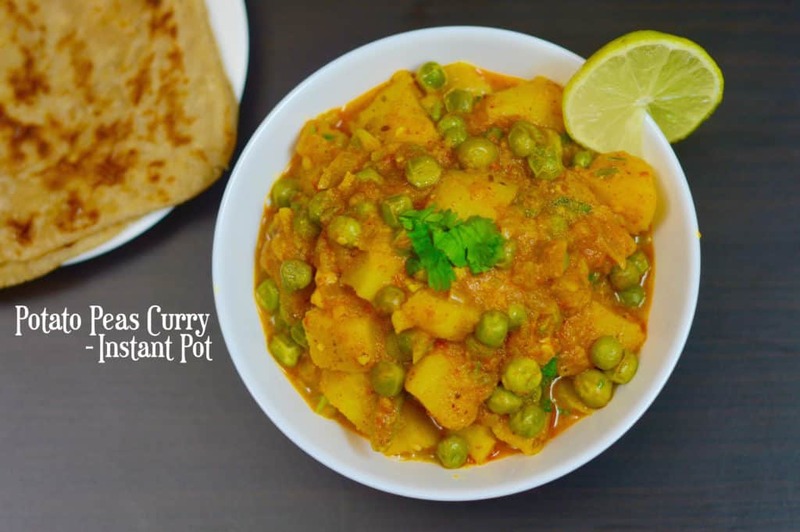 Potato Peas Curry, is an Indian delicacy which is widely made in Indian homes and definitely a delicious side dish which goes really well with chapatis, roti & parathas! Potato Peas Curry is also known as Aloo Matar Subji in Hindi ie aloo means potato,matar means peas and subji means Curry. 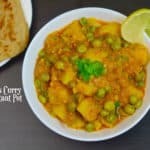 Potato Peas curry, is an Indian delicacy, which is widely made in Indian homes and definitely a delicious side dish which goes really well with chapatis, roti & parathas! Prepare tomato puree by adding 2 medium sized tomatoes into the blender with little water and keep aside. Once POT is hot add cumin,onions,ginger-garlic paste,green chili and fry until onions turn light brown. Next add prepared tomato puree,red chili powder,turmeric powder,coriander powder,garam masala powder and cook for 1-2 minutes. Add peas,potatoes and salt and mix well. Remove lid away from you,add cashew-nut cream or fresh cream and garnish with cilantro. Potato Peas Curry is ready, serve with hot with chapatis, roti & parathas. Once cooker is hot add cumin,onions,ginger-garlic paste,green chili and fry until onions turn light brown. 1.If you want to keep curry little dry,then reduce the amount of water. 2.You can skip adding cashew-nut cream or fresh cream ..this is added to make curry more rich. 3.You can make cashew-nut cream by blending few cashew-nuts and water in a blender. 4.You can also add finely chopped tomatoes instead of tomato puree.But i prefer adding puree to get nice gravy. 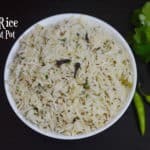 Instant pot Mint Rice/Pudina Rice. Press saute mode on Instant Pot. Add ghee or oil and once it's hot add Bay leaf,Cinnamon sticks, Cardamom, Cloves,Cumin/Jeera seeds. Fry for 30 secs(till aromatic). Then add green chillies. Saute for another 30 secs. Add Basmati Rice,water,salt and give a stir . Remove lid away from you,garnish with fresh cilantro/coriander leaves. Add Basmati Rice,water ,salt and stir well. When it is cooled,fluff the rice.garnish with fresh cilantro/coriander leaves. 1.Tastes better with Ghee.Vegans can ignore Ghee(clarified butter) and use oil instead. 2.If you want softer jeera rice, increase the water.Add 2 cups of water for 1 cup of rice . 3.For Indian pressure cooker recipe add Add 2 cups of water for 1 cup of basmati rice. 4.You can also add sliced onions while Sauting,adds more flavour into Jeera Rice.